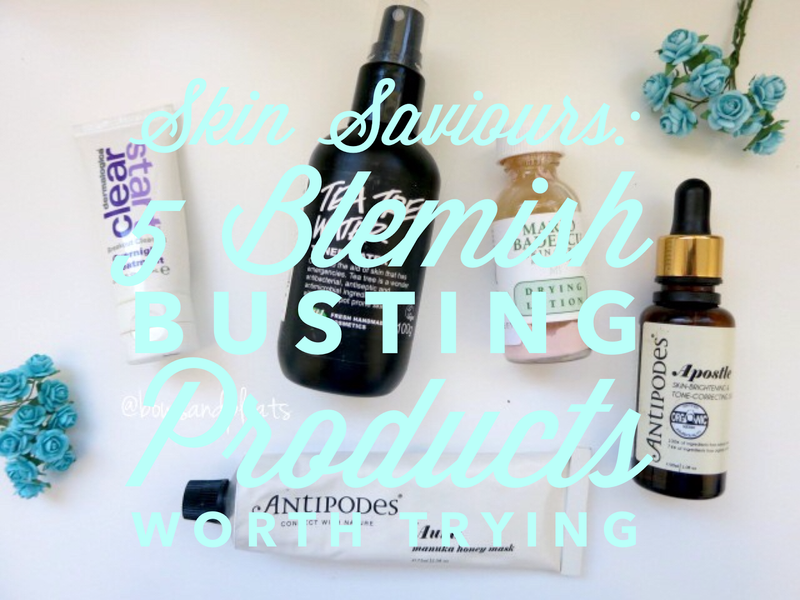 My skin has been breaking out like crazy lately, especially around my mouth and chin (hormones) so I thought it would be a good chance to chat with you about my favourite five products to use when my skin just isn't behaving itself! This overnight treatment is perfect for popping on any areas of your skin that you can feel getting bumpy or where pimples are forming under the skin. It's an invisible, thin cream containing salicylic acid, and aims to reduce congestion and redness in the skin. This cream also contains licorice and cucumber extract to soothe the skin. This is a great treatment because it is not drying on the skin at all so you can spread it across any areas where you feel you need to reduce congestion without having to worry about flaking skin. I've found this treatment to be very effective to reduce congestion and clear up any blemishes which have not yet come to the surface. This toner is both affordable and effective for when your skin is feel a bit gross! It helps fight excess oil, while refreshing and soothing the skin with added juniper berry and grapefruit water. I love using this both at morning and at night after cleansing my face. This drying lotion from Mario Badescu is one of the best spot treatments I've ever used. It is alcohol based, so it smells very strong and is also extremely drying as the name suggests, but when used correctly it can be extremely effective in reducing the size, and redness of a pimple, especially if the pimple has already erupted (gross, I know but I need to tell you all the details!). The bottle contains calamine lotion at the bottom of the liquid mixture, and the rest contains alcohol, salicylic acid and some other acne fighting ingredients. You dip into the liquid with a cotton bud, and make sure you get some of the pink sediment and then apply a very small amount to any blemishes you may have. Due to the calamine lotion being pink, it is very noticeable on the face so it's best if you apply it about an hour before you go to sleep, when you wake up it generally will be soaked into the skin and you can wash it off. I have found that even with quite large and painful blemishes that they have pretty much been cleared up or just slightly red after two to three consecutive uses. This serum isn't directly targeted at reducing blemishes, but it contains a powerful concentration of ingredients aimed at evening out skin's texture and reducing redness. I find it really useful to apply to my skin when I have blemishes that are in the process of healing. The serum contains kiwifruit exfoliating enzymes which increases cell renewal and speeds up the healing process. The serum works well to reduce redness and brighten the skin. It's become a favourite of mine and would be great for anyone that experiences hyperpigmentation or acne scarring. This is one of my favourite masks to apply when my skin is feeling congested because it contains the amazing anti-bacterial properties of manuka honey which treats spots and blemishes while intensely hydrating the skin. The mask smells fresh and calming, containing mandarin and vanilla pod. This mask is hydrating, not drying at all which is why it's one of my favourites because it leaves the skin feeling clean and soft. Well, I hope you liked a look inside my top products for fighting those pesky breakouts! I'd love to know what products you use when you're experiencing blemishes on your skin! My skin has been a pain in the bum lately too! I love the Dermalogica breakout treatment, I tend to use it everynight all over haha :P Lately though I've been using it morning and night and it's helped clear up the spots I have! I just recently bought the Tea Tree water too, and am loving it already! Mario Badescu Buffering lotion is my favourite spot treatment, but I do really want to try the Drying lotion as well! The Manuka Honey Mask and LUSH Mask of Magnaminty are my favourite masks at the moment. When I get spots I use Vichy Normaderm Hyaluspot. It works wonders. I really like using the Queen Helene mint julep mask when my skin is being terrible (always) as well as Paula's Choice Benzoyl peroxide cream. 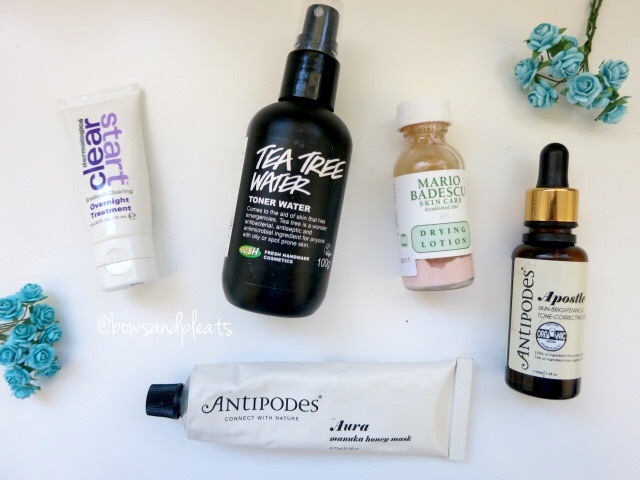 I REAAALLY want to try the two Antipodes products you mentioned. My skin has so many scars and I have a bunch of tiny bumps that I just want to get rid of argh! I love that antipodes mask! It's so soothing when your skin feels angry and stressed out. Which in my case is far too often! I have dry skin so can't tolerate most spot treatments. I just have to be patient and keep it moisturised to help it heal on its own! My skin has just been playing havoc on me this week so I have started to use the Dermalogica breakout treatment in the morning as well so thank-you so much for the tip, I hope it starts to make a difference on my skin! I hope you like the tea tree water, I don't find it makes a massive difference but I just feel like it is good to make sure you are getting all the germs off your face and removing any makeup you may have missed after you cleanse. What are the main differences between the buffering lotion and the drying lotion do you know?